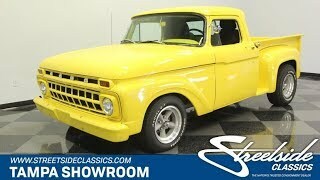 Hi, I am interested in your 1965 Ford F100 (stock #1718-TPA) listed on Autotrader for $25,995. I'd like to get more information about this vehicle and confirm its availability. Bold color, big V8 power, and a ton of other upgrades means this 1965 Ford F-100 Stepside is the ideal standout custom pickup, and its offered right now for quite an obtainable price. This truck has an eye-catching custom look from any angle, and the paint has a lot to do with it. The yellow had a bold modern flair that loves the sunlight. And it looks so good that they even color matched it on places like the grille and bumper for added distinction. In back, theres a smooth roll pan with integrated taillights. And this one has a terrific profile with sporty American Racing Wheels and a few inches taken of out the roof for a lower/sleeker silhouette. But even with all these custom pieces, this truck never loses its vintage appeal. You see it in all the curves of the sheetmetal and the real wood in the truck bed. So it has the right look for a true custom classic. Inside is also a nice combination of vintage and new. It starts with a set of high-back bucket seats that are far more comfortable than anything that came out of the 60s. The black on the seats matches the carpeting, and its all a nice contrast to the external yellow that returns on the dash and doors. You get great classic pieces like the factory gauges and artful steering wheel. But a full set of auxiliary readouts and the B&M floor shifter are there to let you know theres something special under the hood. The engine bay has more of that great bold yellow on the smooth firewall and vender walls. But the real showcase is the V8 in the middle. The consignor states this is Fords mighty 427 cubic-inch V8. It inhales deeply with a Holley four-barrel carburetor, and it exhales with authority as shorty headers add power while contributing to the rumble of the dual exhaust. Plus, the big V8 has the right supporting components like steel-braided lines and an aluminum radiator w/electric fan. You can see from the undercarriage photos that there has been a more recent investment in Fords twin I-beam front end, and this features Fords stout 9-inch rear. Add in the three-speed automatic transmission and front disc brakes make, and this is nice for both performance and cruising. This is a big power custom truck that was built to grab attention. Its a cool total package thats available right now for an irresistible price. Call today!! !